Purists will no doubt argue between the merits of the Broadway production starring Andrea McArdle as the lovable orphan, and this 1982 film starring Aileen Quinn (and to a lesser extent the 1999 Disney version), but the bottom line is that while all the various renditions of Annie were charming and endearing musicals, this John Huston-directed film version has the benefit of permanence that the live production obviously doesn't have. This new Special Anniversary edition from Columbia TriStar, with dramatically improved DTS and 5.1 audio (compared to the 2000 release), showcases the scruffy-headed little girl in all her wide-eyed, musical glory. 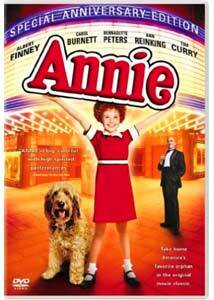 Annie (Quinn) is the scrappy Depression-era orphan who is determined to be reunited with the parents she never knew, and who catches the eye of not only world-famous billionaire Daddy Warbucks (Albert Finney), but a trio of money-hungry villains led by dictatorial orphanage headmistress Miss Hannigan (Carol Burnett), and Hannigan's brother Rooster (Tim Curry) and his gum-smacking gal pal Lily (Bernadette Peters). The story is deceptively simple and timeless, and though the characters are clear cut and one-dimensional, the whole thing is built around a series of big theatrical production numbers, and the stars of Annie are the memorable songs. It's hard to imagine not having It's A Hard Knock Life, Tomorrow, or Maybe rattling around your head for days after sitting through even through a single viewing. Legendary director John Huston (Key Largo, The Treasure of Sierra Madre, The African Queen, The Misfits) certainly seems an odd choice to have helmed such a big, cuddly musical, but he handles Annie with a zesty visual intensity; the sets and production numbers are appropriately lavish, more so than a typical stage production could readily exhibit. This isn't Huston's definitive work by any means, but it does add a completely different layer to his accomplished and varied filmography. The casting of a strong dramatic actor like Finney, alongside the comic talents of someone like Burnett (who nearly steals this version as the boozy Miss Hannigan) gives Huston's version its base star power, but of course it is all up to Quinn's Annie to hold it altogether, which she does wonderfully. She dances around and belts out the signature songs with inspired aplomb, and it would take a real curmudgeon to not be immediately taken in by her plucky attitude and wide smile. Her gentle a cappella version of Tomorrow, sung to President Franklin Roosevelt (Edward Herrmann) is one of film's sweet spots, and Quinn sells it like a pro. Sure, Annie isn't the deepest, most thought-provoking musical around, but this is a really sweet and charming production, ideally geared towards young girls, but it is actually made to appeal to just about anyone willing to be taken in by the catchy songs and the effervescent performances. Still, it is difficult for me to imagine crusty John Huston overseeing fifty dancing and singing orphans. Image Transfer Review: The 2000 DVD release of John Huston's Annie featured a 2.35:1 anamorphic transfer, and sadly this new anniversary edition sports only for a 1.33:1 fullframe print. That disappointment aside, the transfer here is appropriately bright and colorful, despite some minor grain issues evident throughout a number of sequences. No major print flaws or artifacts were evident. Audio Transfer Review: The highlight on the audio side is the inclusion of a brand new DTS mix, as well as a 5.1 Dolby Digital Surround track. Both tracks are very similar in their dynamic range, and both deliver fairly aggressive rear channel activity, especially during the big production numbers. This really gives a lift to the entire presentation, with voices and dialogue remaining crisp and clean, and are never overshadowed by the swelling score elements. Extras Review: The extras are all nicely geared toward the younger set, including My Hollywood Adventure with Aileen Quinn (12m:02s), a look back at the production, and a chance to see how Quinn has grown up since starring as the red-headed orphan. Quinn speaks in simple wonderment about her involvement in the film, and she keeps all of her comments in kid-friendly bursts that should appeal to just about any youngster transfixed by Annie. The Activities section is broken down into three segments: The Age of Annie, Sing-A-Long with Annie, and Act-A-Long with Annie. The Age of Annie is the least interesting, and is an uninspired trivia game melding film clips and pseudo-historical facts. The other two, the sing-a-long and act-a-long are genuinely fun stuff, and offer budding young Annies the chance to either sing Karaoke-style to Maybe, Tomorrow, or It's A Hard Knock Life (available with or without vocals) or to act out three scenes from the film (available with or without prompting and tips from Quinn). Kudos to Columbia on these kid-centric extras, as they are done well and offer enough variation to merit repeat viewing. The least pleasing aspect of the supplements is music video by the poppy pre-fab girl group Play for It's A Hard Knock Life (03m:02s), who manage to turn a perfectly likeable song into three minutes of bad fashion and even worse posturing. This is just shameful. I'm all for cute girls singing, but this version is really pointless. In addition to a set of family-themed trailers and some DVD-ROM weblinks, the disc is cut into 28 chapters, and includes Columbia TriStar's usual batch of subtitle options (English, Spanish, French, Chinese, Korean, Portuguese, Thai). This Special Anniversary Edition is revitalized by a pair of dapper audio transfers (DTS and 5.1), which add a new layer of life to the memorable songs. Leapin' lizards, this is an easy recommendation for musical fans of all ages, despite being a 1.33:1 transfer.